In February, after 15 consecutive months of gains for the S&P 500, investors were finally reminded of what a down month looks like. Investors were also finally reintroduced to the ebbs and flows of normal day-to-day volatility. 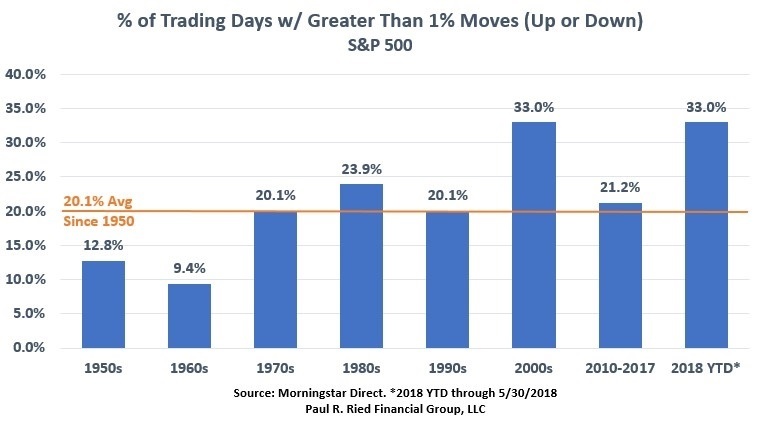 After experiencing only 8 days with moves greater than 1% in the S&P 500 last year (the fewest such moves in a year since 1964), we have already had 34 so far this year. Fortunately for investors, this is still far below the frequency we saw in 2008, when such moves occurred 53% of the time. What has been unusual about recent events is not the volatility of the S&P 500, the unusual part is that the bond market1 has performed poorly at the same time. In fact, over the last 20 years there have only been four instances where the S&P 500 and the bond market both fell by more than 1% over a 3 month period….we just experienced one of those periods (February through April, the S&P 500 was down 5.8% and the bond market was down 1.1%). The only other times this occurred over the last 20 years was once in 2004 and twice in 2008. It seems like the bad aspects of rising interest rates are talked about a lot….it puts downward pressure on bond prices and it increases the costs of borrowing. However, the outlook for savers is a good one as a result of increased rates. Savers notice it first in their savings accounts, money market funds and then short term bond funds via increased interest they receive on those accounts. But even intermediate to long-term bond investors may be better off over time. Despite longer-term bonds taking an initial hit in price, they could ultimately benefit more than if rates stayed lower, as their interest payments and maturing principal gets reinvested at higher and higher rates. The below chart shows a hypothetical situation where rates increased a total of 2.0% with increases of 0.25% every six months2. 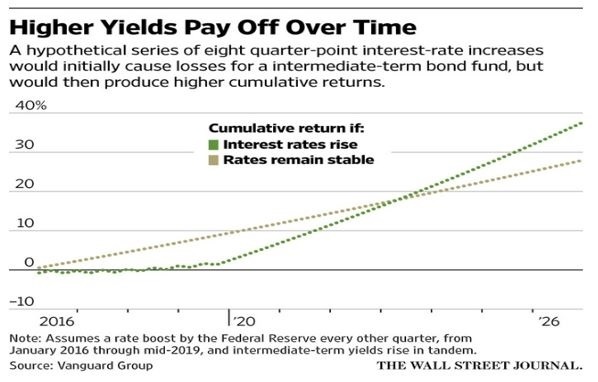 This shows that while the cumulative return was initially lower due to rising rates, the investor would ultimately be better off in the long run. While the above quote was technically dialogue about battle, it applies to investing just as well. However, in both situations, patience and time would not be effective without proper preperation beforehand….but once the plan is in place, “when in doubt, my dear fellow, do nothing”. In the long run, the biggest threat to investors has nothing to do with the unemployment rate, trade policies or geopolitics….it is investors own reactionary impulses driven by the basic human emotions of fear, hope and regret. Yes, the same emotions that drive us to be irrationally concerned of shark attacks, buy lottery tickets and prevents us from persuing another dream after we have failed. Those same pesky emotions run havoc in our investing lives as well. When you feel yourself getting caught up in the day to day moves of the market, it’s important to refocus that thought into the reason you’re invested in the first place. You will likely realize that the unnecessary focus on your portfolio is only distracting you from the real priorities in the here and now....such as your family/friends/hobbies/charities. Very rarely are the day-to-day moves of the market anything more than distracting noise. As we showed earlier, this year the market has moved over 1% about every third day, on average. Yet in aggregate, the market has only moved just over 2% for the year. We encourage you to tune out the markets (whatever they decide to do) and enjoy your summer. Rest assured, we will be here listening nonetheless...noise and all...focused on keeping your plans on track. Opinions expressed are not intended as investment advice or to predict future performance. All information is believed to be from reliable sources; however, we make no representation as to its completeness or accuracy. All economic and performance information is historical and not indicative of future results. The S&P 500 is an unmanaged group of securities considered to be representative of the stock market in general. You cannot invest directly in an index. Past performance does not guarantee future results. The return and principal value of bonds fluctuate with changes in market conditions. If bonds are not held to maturity, they may be worth more or less than their original value.